The Aeron is a highly modular, ready to go, compact surveillance solution using video and thermal cameras which is ideal for short to long range surveillance applications. 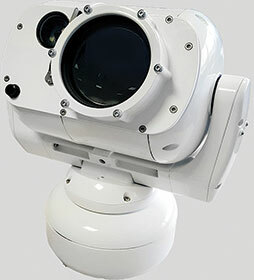 The Aeron is a compact, rugged, continuous ­rotation PTZ camera that has been specifically designed for marine, harsh and challenging environments. With a range of features such as zoom thermal, cooled and uncooled thermal, HD and 4K video as well as IR and white light options, the Aeron is a versatile solution. The Aeron platform can be configured and optimised for a broad range of applications and operational theatres with the ability to detect, identify, track and react to the surveillance requirements. • Supporting ranges up to 10,9 km for human detection and 20,1 km for vehicle detection. • Long range thermal cameras with zoom HD/4K Low Light and 4K ULL (Ultra Low Light. 0.0006 lux) colour cameras. • Thermal camera image contrast enhancements. • Anti-fog, anti-haze, image stabilisation, autofocus and auto tracking capabilities. • ONVIF Profile S compliant.